In my last blog, we explored the philosophy and rationale behind getting an edge. This explained ‘the why’ and ‘the how’ analysis fits into the picture of successful competitive advantage. This blog moves onto ‘the what’ and explores the genesis of value in communications. It really helps to visualise the concept if we build some structure around ‘the what’ with the form of a model. Importantly the model needs to capture both communications components and a flow – a way to see where to refine. After all, it would be a rare campaign that is perfect from day one. My approach is that in all marketing, something, somewhere could be improved to benefit the desired overall result. It’s just a matter of finding that something and knowing how to tweak it! These pillars can be linked into a flow which integrates the business context. That flow can also indicate refinement loops, each an iteration of plan-do-review-refine in time. Integrating these loop-steps into your communications uncovers opportunities. But it is the use and interpretation of relevant metrics which makes the opportunities visible. In fact, the value in the metrics is amplified by the structure like this. Over time the fluctuation of metrics can be related across pillars to link stimulus to response. And that is the key to success in measurement and evaluation of communications. 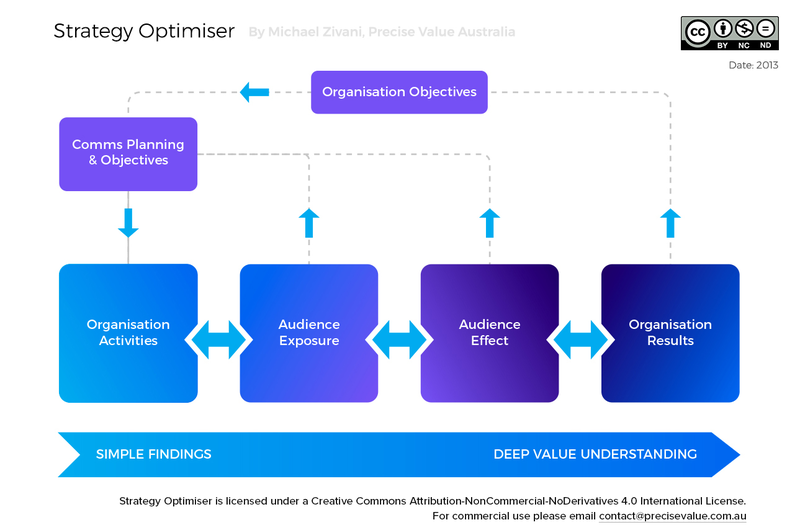 So communications professionals now have access to a practical evaluation model which goes well beyond just demonstrating communications value. It goes to the heart of integrated marketing strategy across all communications activities. Working to the model will allow you iterative refinement that boosts effectiveness and helps reach key organisational goals faster. That gives you the tools to lift the role of communications into another league. For many years, we have been working to a simpler model using just the headings of each pillar. From my work with AMEC through 2012, the idea emerged to show the detail within the pillars. Working to assist the PRIA Measurement & Evaluation Committee, the idea of a circular flow was introduced via the top level objectives. 5. Communications can and should be measured across all disciplines – PR, Social, Events etc. The more complete the picture the more valuable the insight. Both the model and guidelines have been proposed to AMEC as input to their evolution of the Barcelona Principles. Their European Summit in June will provide the forum for that evolution and I will rally the cause to show Australian thinking really can lead International Best Practice!